It’s the thirteenth of the month, and once again all the usual caveats apply: delicate nostrils and wispy sensibilities should click away, click away, click away all! Houle said when he looked into the river he saw the unidentified man’s body. Several condominium residents said they had smelled a foul odor coming from the area of the creek since Friday. One man said he noticed a fertilizer-like smell coming from the area of the creek over the past few days. “I take a daily walk around (the parking lot) and I detected an odor, a strong odor that smelled like fertilizer, real strong,” said Vince Caton. Carol Coppola said she noticed an unusual odor coming from the creek last Friday. The body was later identified as that of a missing 45-year old personal trainer. His death has been ruled a suicide. Utility workers found a badly decomposed body in a ravine Friday morning near Millington [Tennessee]. Shelby County Sheriff’s Office spokesperson Chip Washington said an AT&T crew working along Walsh Road, near Highway 51 and Fite, discovered the body after first noticing a foul odor. “When he looked over, he saw a body wrapped in what appeared to be a blanket,” said Washington. Have you considered an exciting career in apartment management? Residents in Detroit, Michigan, complain to apartment manager about "a foul odor." He opens up the unit in question and finds the body of a man in his 40’s who had been dead a couple of days. There were signs of a struggle and Macomb County Sheriffs are treating the case as a homicide. An apartment house manager in Utica, Michigan, goes to an apartment to investigate reports of “a foul odor” and finds the body of a 48-year-old man who had been stabbed to death. Police [in Atlanta, Georgia] told Channel 2 Action News that a tenant at a halfway house on Dill Avenue smelled a bad odor from the room next to his, so the man crawled through a window into the room where he discovered the body. someone reported a “foul odor” in a wooded area adjacent to the apartments. Workers, particularly employees of the city’s Public Works Department and the Macon-Bibb County Fire Department, spent several hours cutting back overgrown brush—bamboo, privet hedge and the like—beside the rear apartment building. The odor was coming from a dead animal, [police spokeswoman] Gaudet said. A false alarm, but hats off nevertheless to the Macon PWD and the County firemen. What a tough way to spend the holiday weekend. According to KTTS-FM in Springfield, Missouri, police were asked on July 11 to check on a man and woman who lived in a duplex on the west side of town. When no one answered the door, officers left. At 1:30 in the morning, police got a 911 call about “a bad smell” at the same address. In an interview with reporters, [[Captain Matt]] Brown said police noticed the smell, too, and decided to enter the home. They found the man and woman dead in an upstairs bedroom. It appears to be a murder-suicide. Remember that funeral director in Graham, North Carolina, who left a woman’s body in a hearse in the back yard until someone noticed the bad smell? 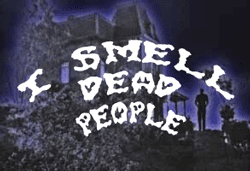 (Ironically, her death had been discovered originally by a foul odor . . .) His disciplinary hearing has been delayed. In the wake of Casey Anthony’s acquittal, it looks like Greta Van Susteren was correct about prosecutors overplaying the I Smell Dead People evidence. In Cleveland, Ohio, the trial of accused serial killer Anthony Sowell is underway. ISDP previously covered the macabre olfactory aspects of the case in House of a Dozen Corpses. The prosecution continued calling witnesses in the Cleveland Strangler trial Wednesday morning. First on the stand, Brandon Pompey, a former tenant of Anthony Sowell’s Imperial Avenue home. He and his wife lived on the home’s second floor. Pompey says a foul odor and rats appeared not long after Sowell moved in. He testified the smell was so bad that he and his family moved out and left much furniture behind because of the fear the smell would follow. “We speculated that maybe there was some maybe a dead animal or something of that effect that maybe had crawled under the house,” Pompey said. Wow..this post is jam packed! It's very interesting that some people thought the foul order was dead fish/animal/rats - they didn't claim to recognize the smell of a corpse, like the Anthony trial witness from the tow yard. In light of Ms. Anthony's acquittal, I wonder how "smell evidence" will be treated in future cases. Good points. Some of these nose-witnesses gave descriptions that would, in a psychology experiment on odor identification, count as a "near miss" (i.e., dead rat:dead body is similar to mistaking lemon:lime). Other reactions (fertilizer, funky creek) probably reflect an effort to use context cues to identify an unfamiliar smell. My hunch is that cops--who encounter dead bodies more often than the rest of us--would be quick to make the connection based on smell. I think they'd make credible olfactory witnesses. Casey Anthony's mother smelling something bad and unsettling and totally out of place in her daughter's car should have been credible too. Where the prosecutor may have gone overboard was bringing in all the scientific experts. Ironically this may have undercut the impact of testimonry from the everyday, fellow citizen types.